Consumed by Abbie Rushton was a really, easy readable book. Right from the beginning I wanted to know more about the two main characters, Myla and Jamie and I wanted to know more about their individual situations. I liked that the story includes some aspects of mental health but at the heart of it, Consumed is a thriller and the identity of who did it kept me guessing! The two main characters are Myla and Jamie and they're sort of thrown together in a well-meaning attempt at kindness between Myla's parents and Jamie's aunt. Myla is suffering from panic attacks and agoraphobia after the murder of her sister two years ago, and Jamie is staying with his aunt for the summer following some troubles at home and a problem with eating. It is thought that perhaps the two could be good for each other and, after a rocky start, they seem to be! I liked that the two main characters are both dealing with mental illnesses. While I feel like Rushton's portrayal of Myla's agoraphobia and panic attacks didn't feel quite like it hit the spot for me and that perhaps other authors have done this better, I did appreciate the addition of a male teenager with an eating disorder. I'd very much like to see more of this in YA. Jamie is really struggling throughout this story about eating and control and I really liked that his aunt in particular was quite supportive of Jamie's route towards recovery. Aside from the thriller aspects, which I'll get to in a minute, and the mental health issues, my favourite part of the book is that Myla is a food blogger and spends a great deal of her time indoors cooking food and writing blog posts about food. I'd love to read some of her blog posts! I loved the variety from the origins of carrot cake, Mauritian food, and her attempts at the perfect recipe for chilli brownies, I think it'd make for fascinating reading. In fact, Myla spends a lot of her time online. From updating her blog, her online friendship with a girl called Eve ... but she's also interested in setting up a website that exonerates the man who has been convicted of her sister's murder. This is obviously a contention between Myla and her family and is the basis of the thriller-ness of Consumed. I think the small-town setting helped this story along, as well as the different characters and how Abbie Rushton weaved everything together. I was definitely doubting many characters throughout the story unfolding and I love to be kept guessing like that! 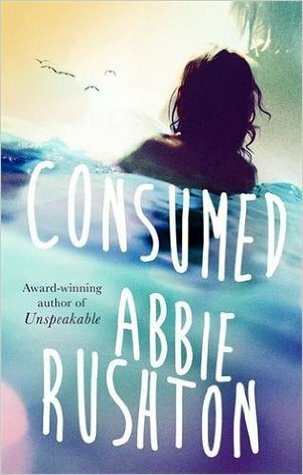 So while there were some faults with Consumed it was definitely an interesting and pleasurable book to read and spend several hours with! This book counts towards my British Books Challenge 2017!